After graduating college I remember dramatically throwing myself onto my (mother’s) couch and complaining about my unsuccessful job hunt. “Every ‘entry level’ job wants ‘one to three years of experience’ but how are you supposed to GET experience if you can’t get an entry level job? !” I wailed. Not only did I lack a wealth of job experience to back me up, I felt like my resume looked virtually identical to the resumes of everyone I graduated with. With my endless supply of free time, I began spending a lot of time on social media (Twitter in particular), following people in my industry who I thought I could at least learn from. By developing these relationships, participating in conversations, and sharing content, I was unknowingly building a personal brand that filled the void of experience that my resume lacked. As a result, I’ve had three jobs that can be directly attributed to Twitter—and each one happened in a different way. I used Twitter to build a relationship with someone who eventually became my business partner. I applied for a job I found in a Tweet and ended up moving across the country for it. And most recently, I reached out to someone I followed who worked at a company I wanted to work for (called Hootsuite) and they were able to put me in touch with a hiring manager. Here’s what I’ve learned about landing a job using social media, and tips for how you can use it to demonstrate your own ambition, common sense, and curiosity—qualities that any employer should always be on the lookout for. Recruiters use social media the same way everyone else does: for creeping people. When a potential employer searches your name, you want to be able to control what they find as much as possible. Make sure the name you use on your resume matches the name you use on your social media profiles. If and when possible, use the same handle across all your social networks. Ensure your profiles (especially LinkedIn) have the most up-to-date information about yourself on them. Using the same profile image consistently across each social network can make it easier for people to find you as well. Create a personal website. Even the most simple site can increase the searchability of your name. Kissmetrics suggests creating a separate “profile page” on your site, (using your name in the URL if possible) and having all of your social profiles link to this page. Services like Squarespace or Wix can make this really easy to do. If you don’t want to create a full blown website for yourself, Sumry is a webapp that allows you build a beautiful online resume that can also easily be downloaded as a PDF. You may think you’re covering all your bases by having a squeaky clean social media profile that you link to on your resume and “private” accounts that you use to chronicle all your weekend debauchery. But nothing—I repeat, nothing—you post on social media is private. The day will come when you overlook a crucial privacy setting on Facebook, post something to the wrong account, get tagged in an embarrassing photo, or have a mutual friend in common with your new boss that makes your profile more accessible to them than you’d like it to be. Instead of leading a double life, try to strike a balance between your professional and personal self on all your social media profiles. Don’t hide your sense of humor or quirky interests, but don’t post anything you’d be embarrassed by a potential boss seeing. This will help protect your reputation online while giving potential employers a glimpse of your personality—something that can help show them you’ll be a good culture fit for the company. With 44 percent of hiring managers saying that a proficiency in writing is a top skill missing among recent college graduates, how you write on social media is an important reflection of your potential abilities. You don’t need to Tweet as if you’re a Pulitzer Prize-winning author, but brush up on your spelling and grammar skills, use punctuation properly, and put some effort into the things you write. It won’t go unnoticed. A great way of showing off your writing chops aside from your cover letter is by publishing posts on LinkedIn Pulse. To get ideas on what to write, browse through some of the most popular posts. Write from your unique perspective as a recent graduate and share your insights about the industry you’re hoping to work in. Along with browsing sites like LinkedIn or Monster, monitoring Twitter is another great way to use social media to find potential job opportunities. Your best bet is to monitor both industry-specific hashtags (#prjobs, for example, is all about job postings for PR and communications) and location-specific hashtags (#austinjobs, #yyzjobs, etc). 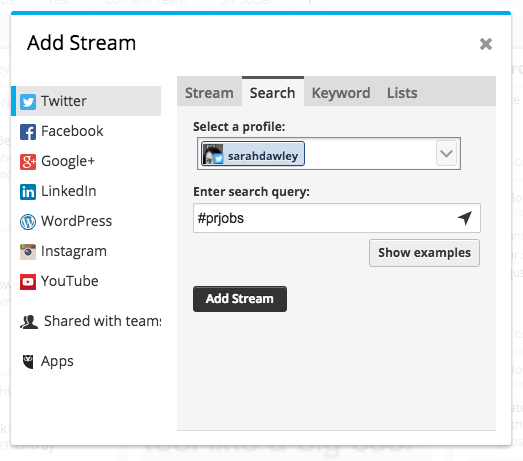 Set up search streams in Hootsuite for these hashtags and you’ll be able to see a constant stream of Tweets related to the types of jobs you’re looking for. 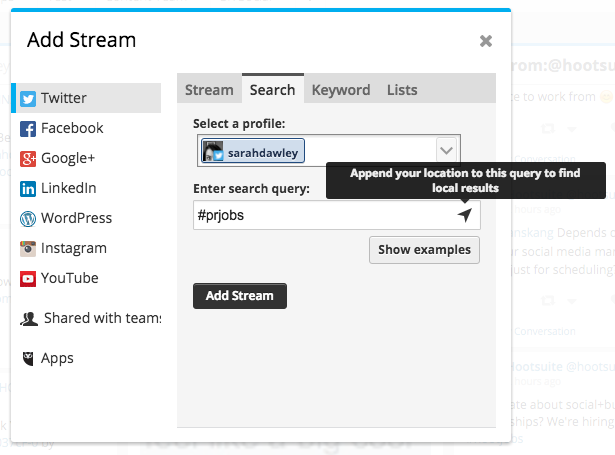 You can even geo-target the search results so that you only see Tweets posted from within a certain area. 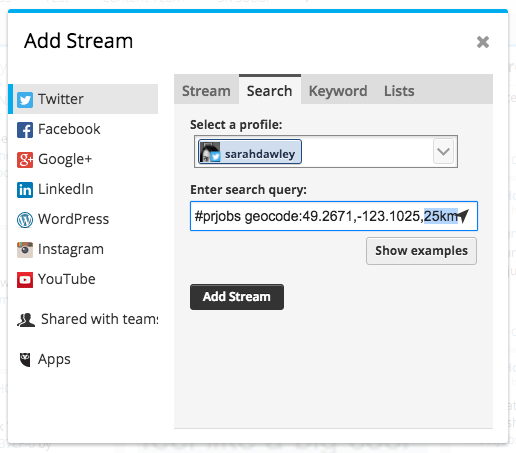 Click “Add Stream” in your Hootsuite dashboard. Enter your hashtag in the “search query” field under the “Search” tab. Geo-target your search by clicking on the arrow in the search query field. It will automatically populate with the coordinates of your current location. You can search within a larger area by editing the search radius (which is highlighted here). Instead of sending five emails a day to whom it may concern, social media gives you the opportunity to identify and connect with a real human being who can help move your job search along. Introducing yourself on social media to a recruiter or hiring manager helps put a face to the name on your resume and keep you top of mind when new opportunities emerge. If introducing yourself to a stranger on social media apropos of nothing isn’t your thing, here are two ways you can ease into networking on social media (while learning a lot in the process). Participate in Twitter chats about the industry you’re hoping to work in. Ask questions and try even sharing some answers when you feel comfortable doing so. Twitter chats are a great educational resource and an even better networking opportunity. Follow the people participating and introduce yourself. Thank people for their insights and ask if they’d be willing to answer any additional questions you may have. Joining and participating in groups will allow you to learn directly from professionals in your field, make online connections that could turn into offline opportunities, and increase your visibility on LinkedIn for recruiters and hiring managers. Browse through the directory of LinkedIn Groups and join a few that you think could benefit you in your job search. Join in on discussions and share relevant content you think the group would appreciate. Most importantly, check out the “Jobs” tab in each group you join. This is different than the main “Jobs” section of LinkedIn, giving you access to job postings that are tailored for that specific group. The “Jobs” tab is located under the box where you compose messages in your LinkedIn group. Screenshot via LinkedIn. Along with recruiters and hiring managers, use social media to build relationships with people who can offer long term guidance and open the door for future opportunities. An informational interview (which is just a fancy term for a conversation) is a way for you to get valuable insights into a particular company or industry and advice for beginning your career. Whether you chat in person, on the phone, or via email, these conversations will help turn your online connections into meaningful offline relationships. You may instinctively want to aim for high-level executives but don’t ignore the people who are five years or less into their careers. They were in your situation more recently and may be able to offer you more practical advice as a result (plus, their schedules will be a lot more accommodating). Building a network, creating relationships, and propelling your career forward will take time—and it won’t always work. You’ll reach out to people and get rejected. You’ll nail a cover letter and never get a call back. You’ll go for an interview and you won’t get the job. The good news is that social media moves at a lightning pace, meaning there are new opportunities popping up every day. Continue investing time and energy into your personal brand and relationships on social media, and you’re bound to reap the benefits. Learn the fundamentals of social media marketing and set yourself apart from other job applicants with free training from Hootsuite Academy.